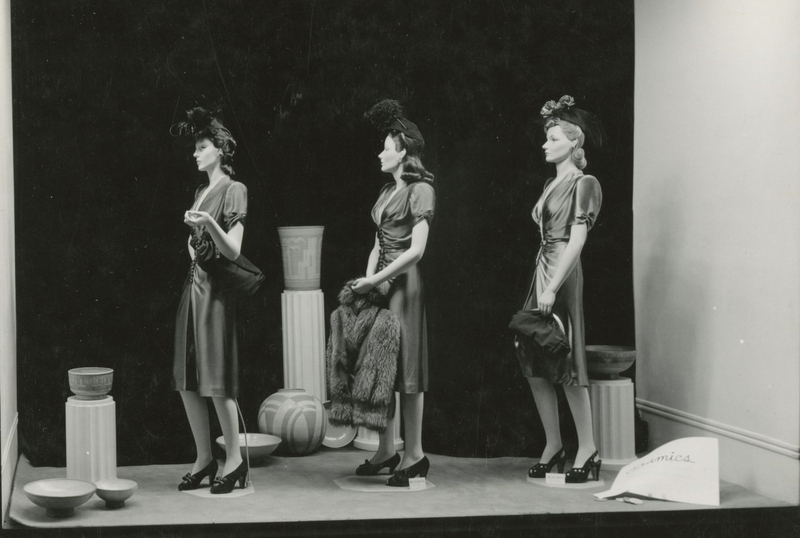 In November of 1942, Maija Grotell displayed her wares among the latest fashions in the windows of Himelhoch’s department store in downtown Detroit. Grotell, Head of the Academy’s Department of Ceramics from 1938 to 1966, placed her vases, pots, and plates in a stage-set ceramics studio, replete with a painted kiln, bottles of glazes, and a potter’s wheel (made of what appears to be Papier-mâché). 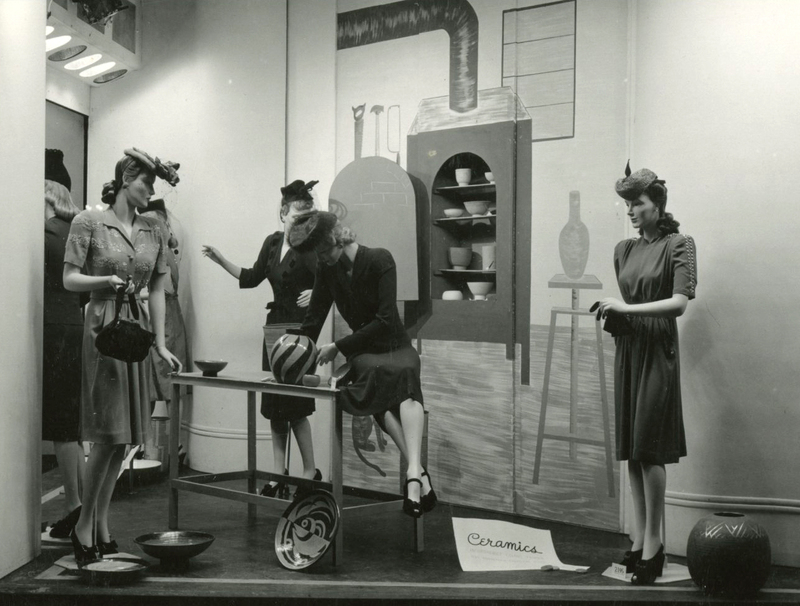 The clothes related directly to the vessels, with the sign reading: “Ceramics: Wonderful Muted Colors To Wear Under Winter Coats Inspired by Maija Grotell’s Ceramic Masterpieces.” Himelhoch’s sold the clothing, while the Grotell works were sold through the Detroit Artist’s Market. 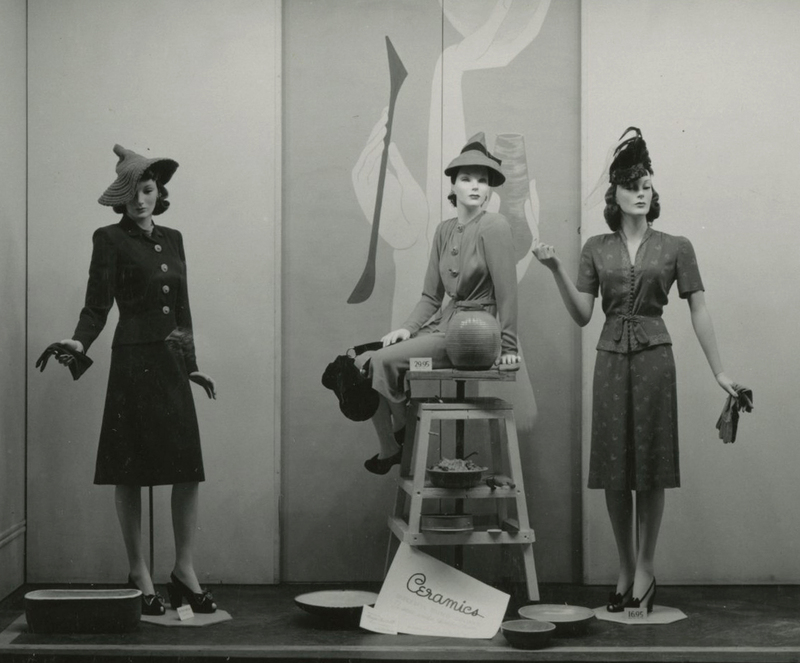 The images are attributed to photographer Joseph Munroe, November 2, 1942. NB: Himelhoch’s opened in 1907 and was on Detroit’s Washington Boulevard from 1923 to 1977. The lovely building is a National Historic Landmark and survives today as apartments. 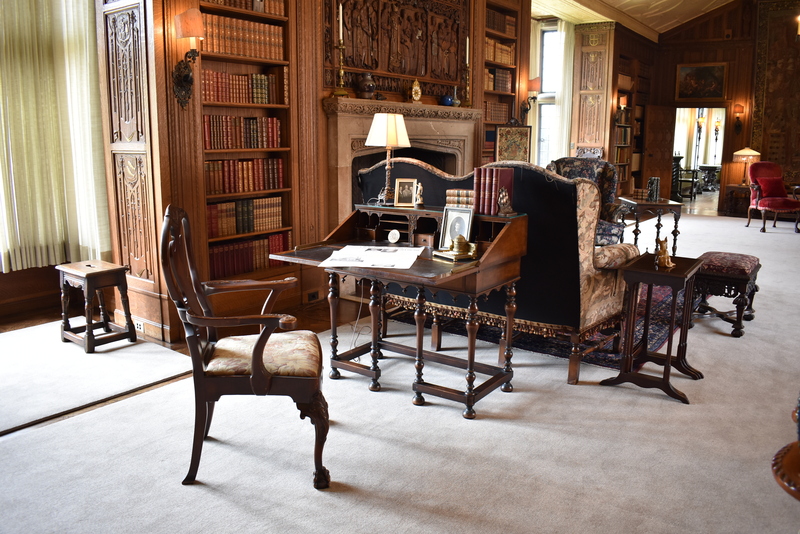 Recently, after years of research and investigation, the carpeting in the Cranbrook House Library was restored to its original appearance. 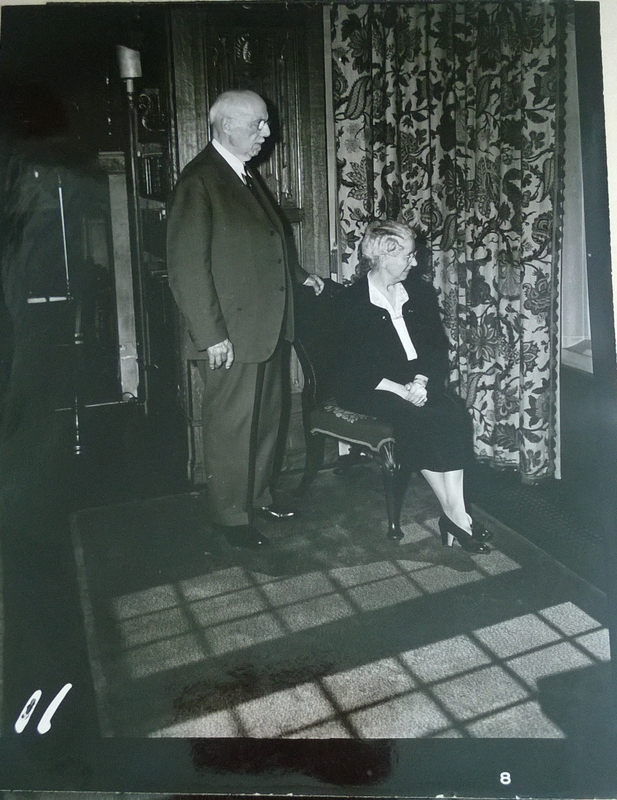 The previous rugs were donated to Cranbrook House in the 1990s but were not historically accurate. 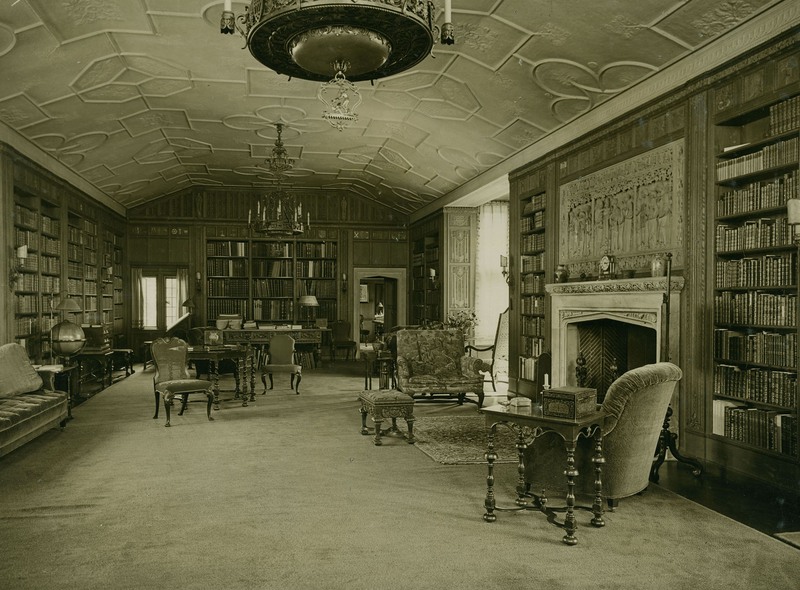 By studying images of the Library in Cranbrook Archives, we could determine that in George and Ellen Booth’s lifetimes there was a large, solid carpet on the floor, not the oriental rugs seen in recent years. 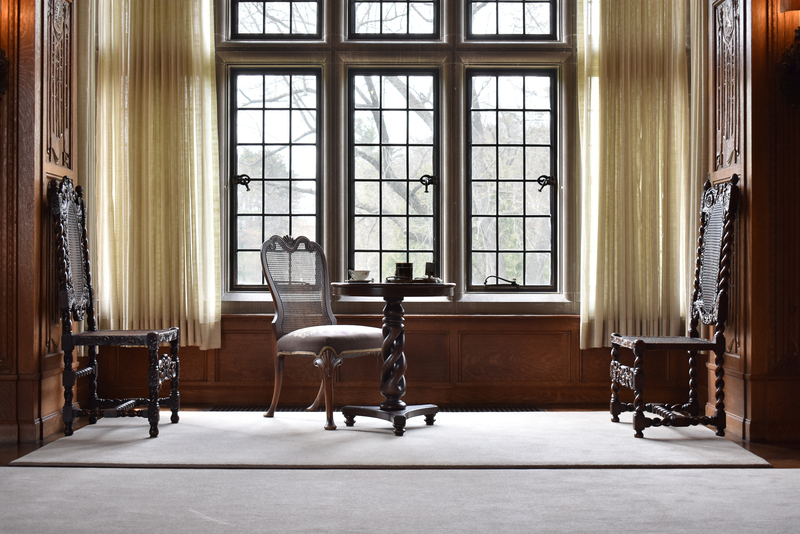 A review of the Cranbrook House 1921, 1933, 1937, and 1949 inventories (itemized lists of the house’s contents for insurance purposes), as well receipts and historic images, revealed the style and color of the rug: Axminster mottled brown or taupe. 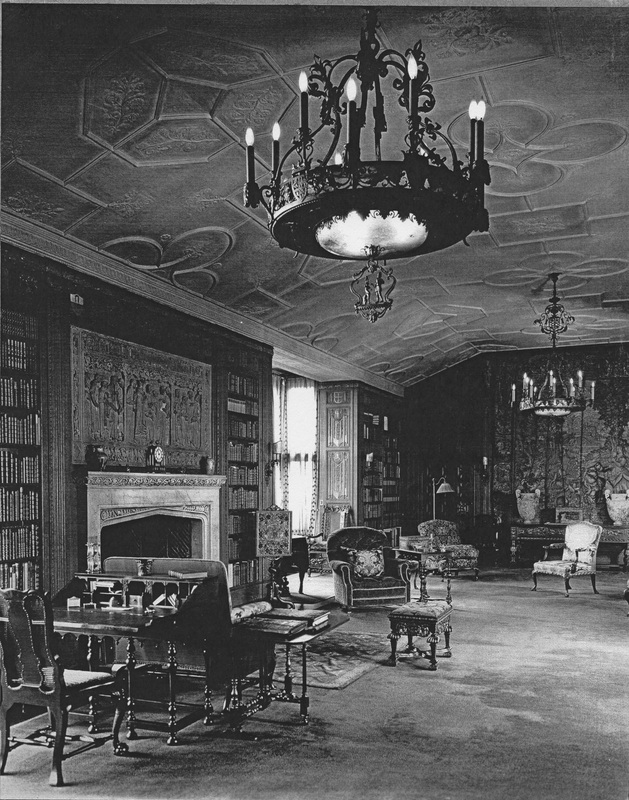 This may sound boring, but monochromatic rugs were chosen by the Booths to draw visitors attention up to the furnishings, books, elaborate carvings, and tapestries in the Library. Axminster was both a brand name and specific type of carpet. Axminster is cut pile carpet (a style of carpet where the woven loops are cut leaving straight tufts of carpet). It derives its name from the small town in England where the process of weaving its distinctive style was created. Looking for a modern, cost-effective equivalent, made in the same fashion as the original Axminster, led us to Bloomsburg Carpet Industries, Inc. They have woven wool broadloom Aximinster and Wilton carpets in Bloomsburg, Pennsylvania using traditional methods since 1976. With the help of interior designer (and Cranbrook Academy of Art Board of Governor) Lynda Charfoos, we were able to select a color that both closely matched the description “‘mottled’ brown or taupe” and also looked great with the tones and colors of the Library. 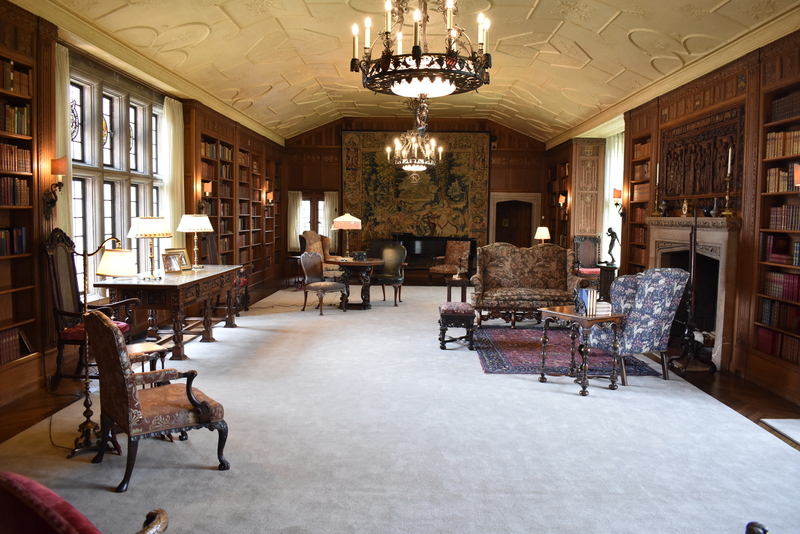 On April 30, we cleared the Library so that on May 1, the rugs could be installed by Carpet Design Group, LLC. Workmen from Carpet Design Group fusing together the four sections of the carpet. Library circa 1925. Courtesy of Cranbrook Archives. Courtesy of Cranbrook Center for Collections and Research. We feel guests and staff alike will enjoy this return of the original look to the Library. It will allow the carvings to pop, the colors in the tapestries to appear stronger, and make for a more historically accurate room. Continuing to keep the Booth house looking its best is all part of helping to tell the Cranbrook story to guests from the neighborhood and around the world. Photograph by Jim Haefner. Courtesy of Jim Haefner and Cranbrook Center for Collections and Research. The Center would like to thank the following, without whom this project would not have been possible: Cranbrook Educational Community, Cranbrook House and Gardens Auxiliary, Lynda Charfoos, Bloomberg Carpet, Carpet Design Group, and Chet’s Cleaning Service. Special thanks also to Jim Haefner for photographing the Library. Come see the new look of the Cranbrook House Library this summer on a Cranbrook House and Gardens Auxiliary house tour. I recently processed the James H. Carmel Papers, a small collection that largely consists of correspondence between Carmel and Cranbrook Institute of Science Director Robert Hatt from 1973 to 1989. It is wonderful correspondence that conveys an enduring friendship across the miles as, after Cranbrook, they lived on opposite sides of the country. One of the delightful aspects of their correspondence is their enthusiasm for their work, and how the interests that drew them into their professional roles remained with them after retirement. They never lost their curiosity and wonder, or their sense of humor. On a similar note, their love of Cranbrook did not end when they left campus, as they kept up with and discussed new developments that are shared through bulletins and newsletters. I feel sure that many readers of this blog site are just the same. James H. Carmel was the Assistant Preparator at Cranbrook Institute of Science between 1939 and 1942 when he joined the Army Air Corps. He returned to Cranbrook after the war and remained as Preparator, Trustee, and Head of Exhibit Section until 1973, when he moved to California to work for the George C. Page Museum in Los Angeles. 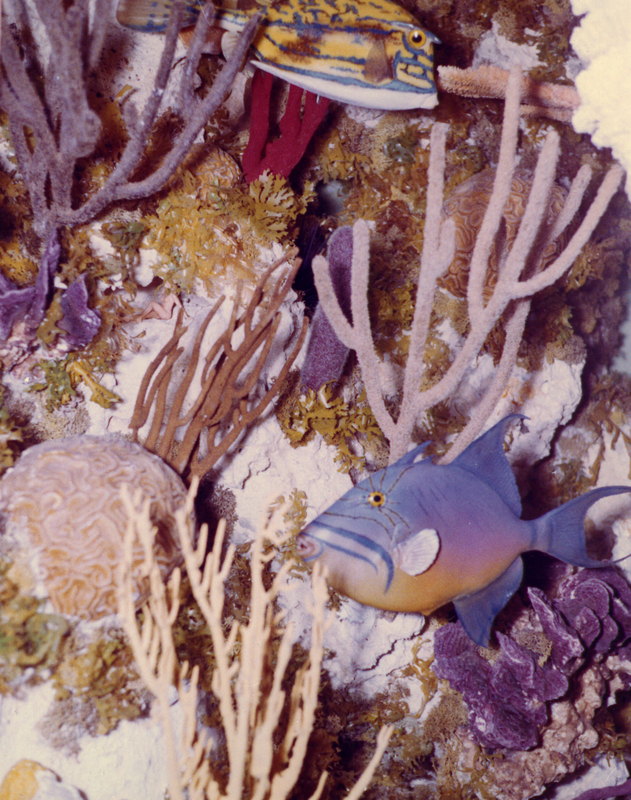 A notable exhibit that was supervised and assembled by Carmel was the Coral Reef Exhibit (1959), which was a reconstruction of the Coral Reef at Nassau made up of approximately 5,000 painted beeswax models. 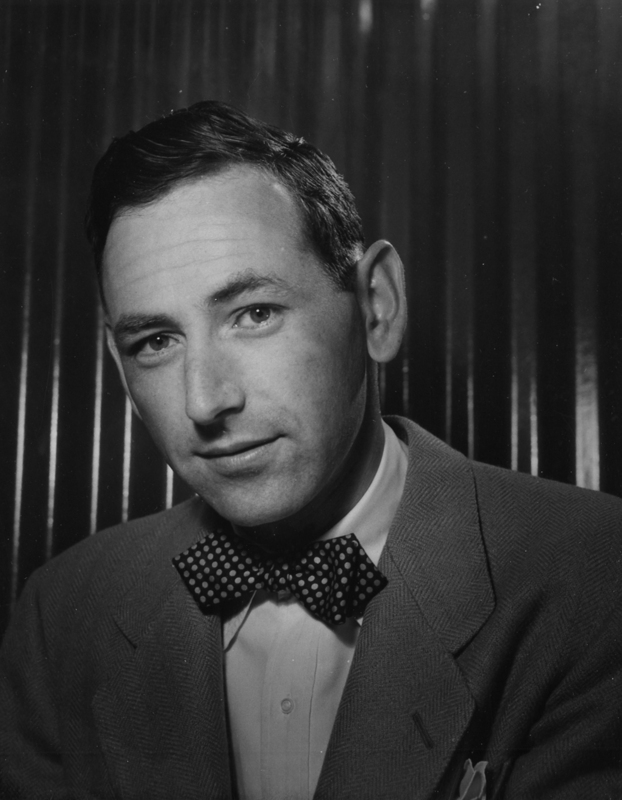 He is the author of Exhibition Techniques: Traveling and Temporary (1962). He died on July 30, 2016, aged 97 years. The “bananas went a-missing” and Kingswood School’s Chiquita Banana Scholarship. The thief who stole the (attributed to) Rembrant Peale portrait of George Washington and the mysterious return of Perseus on the porch of the Thornlea Studio Archives. Gates and andirons and architectural details like the lead conductors at Cranbrook House designed by New York metalsmith Oscar Bach. Cranbrook’s mid-century modern Edison House, the House of the Poet (never realized thank goodness! 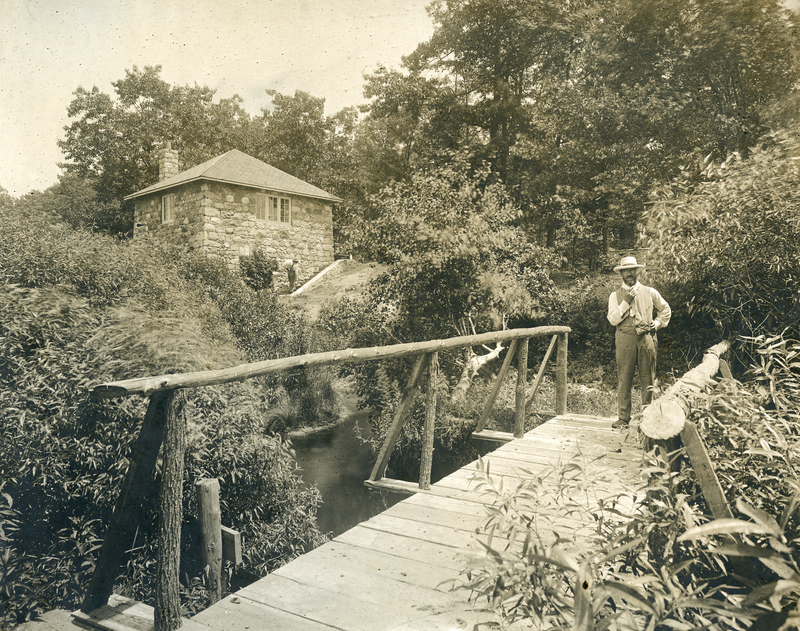 ), Chanticleer Cottage (which used to be the chicken house), Walnut Cottage, Tower Cottage, and Brookside Cottage (also known as the Honeymoon Cottage or Stonybrook) which evolved from the original pump house. And the people! 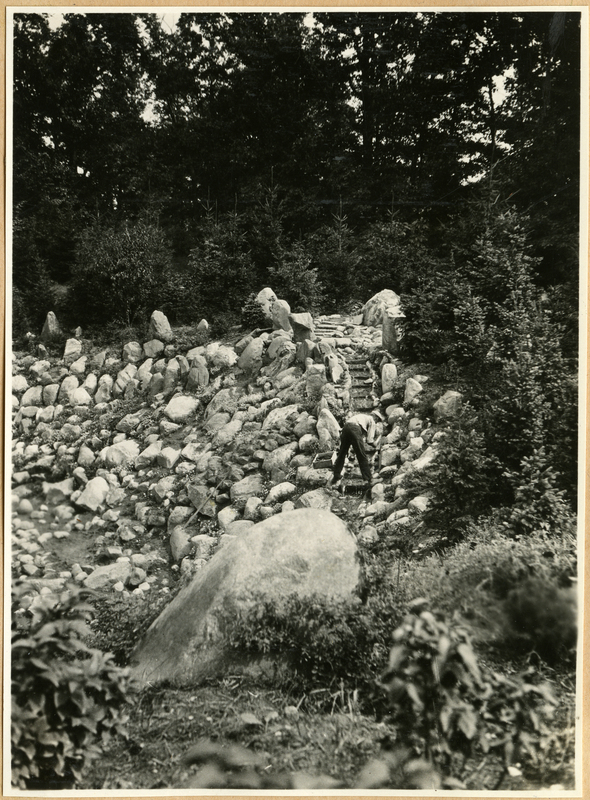 The Italians who literally moved mountains of dirt and rocks, graded the roads, and built the stone walls and beautiful rock gardens that lined the campus. 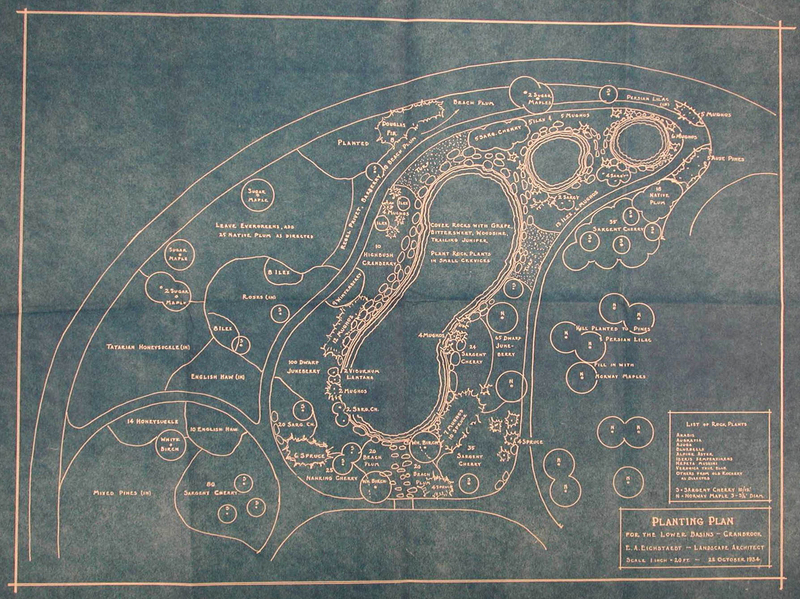 Landscape architect Edward Eichstaedt, who designed the original planting plan around Jonah Pools and later worked on landscape design for Eero Saarinen’s General Motors Technical Center. The women who left their mark at Christ Church Cranbrook – Kathryn McEwen, Hildreth Meière, and silversmith Elizabeth Copeland. Cranbrook School’s art teacher John Cunningham and his mosaics (which can still be seen today) Kingswood School’s French teacher, Marthe Le Loupp, and Brookside’s dietician Flora Leslie. Notable national celebrities connected to Cranbrook: Leonard Bernstein, Dave Brubeck, Amelia Earhart, Henry Ford, Eleanor Roosevelt, and Anne Morrow Lindbergh to name just a few. But perhaps most interesting to me was learning the stories of those not so well known: Ebba Wicks Brown – the first registered female architect in the state of Oregon who came to Cranbrook to study architecture with Eliel Saarinen. Colonel Edwin S. George, a Detroit businessman and philanthropist who was affiliated with Cranbrook in a variety of ways – most notably for his contributions to the Institute of Science. 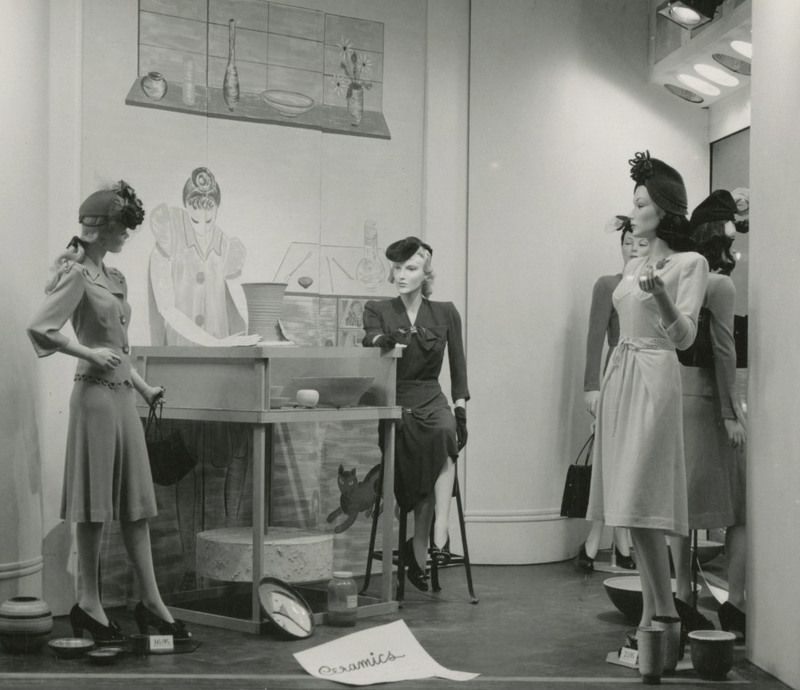 Myrtle Hall – the first African American model at the Cranbrook Academy of Art and Cleo Dorman – another model who was infamous for collecting paintings of her done by famous artists. And so many, many more names still swirling around in my brain. 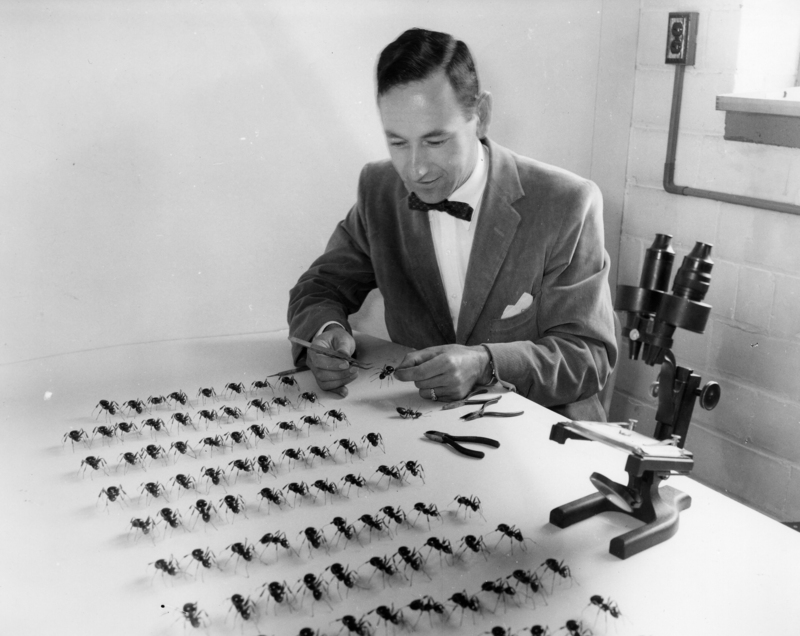 Perhaps my greatest joy here has been to help researchers find the answer to their questions, and to guide them towards collections that they might not have thought of – which has often led to a change in the course of their research. 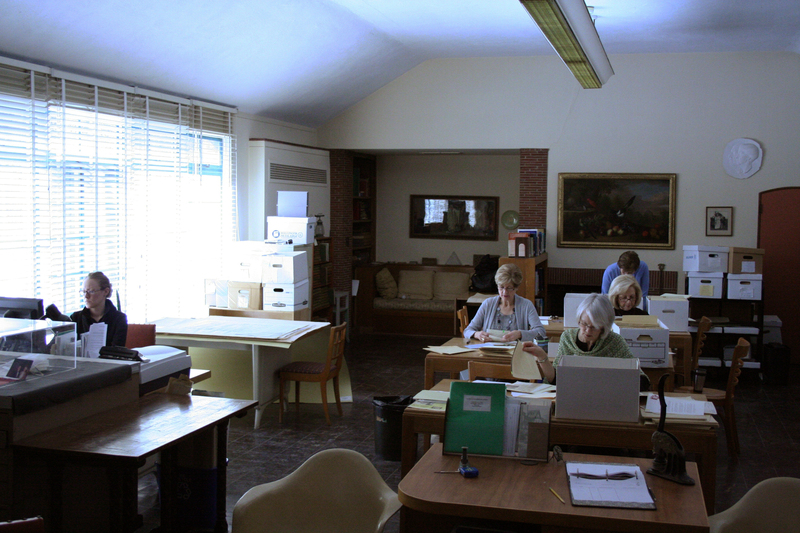 I am very proud of the fact that Cranbrook Archives has an international reputation for exemplary service and for being so organized and easy to use. I will miss working with the many students, faculty, staff, researchers, and scholars as you have taught me as much, if not more, than I have taught you. Thank you for that. And, thank you to the Cranbrook Kingswood Senior May students and the many archival graduate students who have worked on projects over the years, and a special thanks to the most amazing volunteers! We couldn’t have accomplished all that we have without you. I will close my final Cranbrook blog post by doing what I have tried to do my entire 16 year career here – promote Cranbrook Archives. 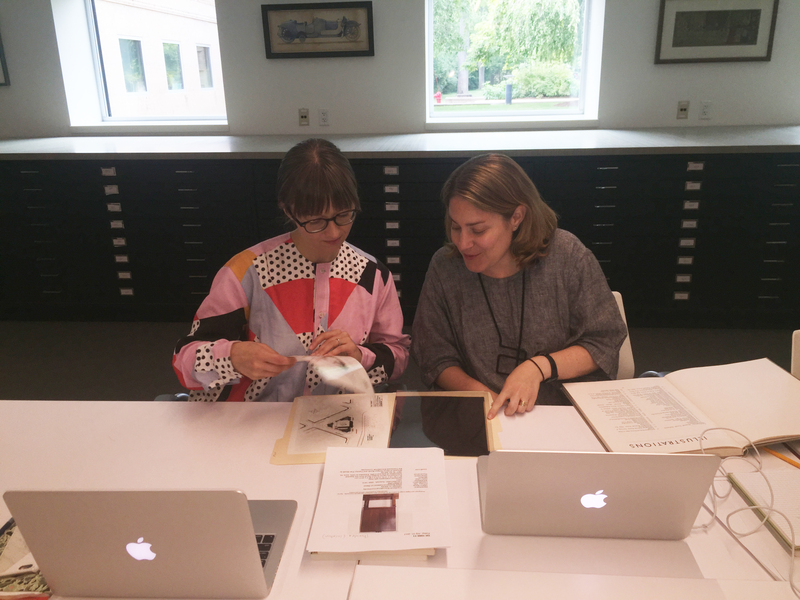 In the archival profession, one constant issue many of us face is how to demonstrate to our institutions and constituents the importance of an archives – why archives matter. I could wax on, but instead I leave you with this article in the hopes that all who read it will have a new appreciation for the work that archivists do every day to preserve institutional memory. History matters. Archives matter. I am proud that I played a small role in preserving Cranbrook’s rich history. And on that note, I bid adieu.